Are you an idea junkie? Me too. Edge.org is an association of high-level scientists and thinkers that ponder the big questions. One of their activities is their Annual Question, which is posed to their elite members. 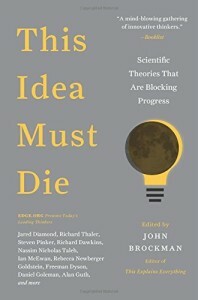 This has led to a book series, including the upcoming This Idea Must Die: Scientific Theories That Are Blocking Progress. The idea that I believe is ready to retire is “the Universe….” The Universe we see around us is just one part of a much larger, multifaceted multi-verse….if you’d go far enough out there [beyond what we can see with our telescopes], you’d find pieces of the Universe…where you’d find all possible combinations of what’s allowed by physics playing themselves out because our universe is effectively a giant computer, and everything that could be possibly be computed is being computed…. Once one’s given up this piece of useless baggage that there is only one universe, we really are forced to contemplate the actual physical existence of things beyond what we can just have experimental and observational access to, and it gives us a nice explanation for why the universe is so darned intricate and complicated. ~ Seth Lloyd, professor of quantum mechanical engineering at M.I.T. Translation: The Universe that we can observe is too complex to have developed by pure chance and physics. Therefore, since there is no God, we must be open to other non-observable ideas like the multi-verse. The idea that must be retired is the atheism prerequisite, the idea that the only way science can work is if we assume we live in a godless, meaningless universe…. [this] makes people assume that reality emerged from the big bang…as if everything that we know and think, everything from civilization to consciousness to meaning are all emergent phenomenon, all a result of matter doing various materialist things. When I started to realize that much of science’s insistence on atheism was suspect was when I heard these folks talk about the singularity. They have a narrative for how consciousness develops, that information itself was striving for higher states of complexity….and now computers are coming…so information can just migrate from the human consciousness into artificial intelligence, at which point the human species can just fade away. And that’s when I realized that they’ve created their equally mythological story for what’s happening, with a beginning, a middle and an end, which is just as archaic and arbitrary as any of the religious narratives out there, and the irony for me is that it’s the most outspokenly godless of the scientists who fall most tragically in the spell of this story structure. Scientists, evolutionary biologists seem to need to start the universe from zero in order for their models to make sense. What if we don’t have to make science and our view of reality conform to the basic story structure of beginning, middle, and end. If there was something here before the big bang, then the story science is trying to tell doesn’t really work…. Atheism can’t be a prerequisite for the scientific model, because if you are forcing yourself to strip reality from reality in order to observe it, you are tying your hands behind your back and missing a huge potential part of the picture. ~ Douglas Rushkoff, author and professor of media studies at Queens College, CUNY. Translation: Assuming the atheist narrative is limiting to the pursuit of knowledge and truth. There are more ideas discussed, including the twin ideas that free markets are all good, or all bad (it depends on the virtue of the groups employing them, duh! ), that using mice to explore cancer in humans is worthless, and Steve Levitt’s awful suggestion that the value of human life is a bad ethic. Perhaps that’s why he’s not on the Edge team! Listen to the whole thing (below), it’s pretty good.